Steve Bannon, the former White House chief strategist, is quoted in a new edition of the book "Devil's Bargain" as saying the "anti-patriarchy movement" -- that is, the movement against sexual harassment and assault -- is a powerful political force that will "undo ten thousand years of recorded history." In a preface to an updated paperback version of his New York Times bestselling book, set for release on Tuesday, author and Bloomberg journalist Josh Green writes that he visited Bannon at his Washington, D.C., home while he watched the Golden Globes. 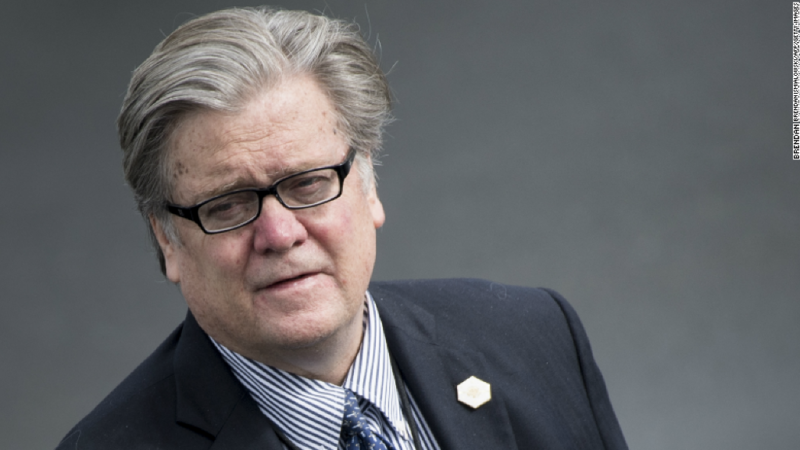 Green says Bannon, who was recently ousted from his position as executive chairman of the far-right website Breitbart, took particular notice of the Times's Up campaign, founded by Hollywood celebrities inspired by the #MeToo movement and the post-Harvey Weinstein reckoning. "It's a Cromwell moment!" Bannon is quoted as nearly shouting, referring to the 17th century political leader often characterized as a fanatical dictator. "It's even more powerful than populism. It's deeper. It's primal. It's elemental. The long black dresses and all that -- this is the Puritans! It's anti-patriarchy." Even if Bannon does not necessarily agree with a movement's political ideology, he's the type of person who admires a revolutionary force. To that point, a person familiar with Bannon's thinking told CNN, Bannon indeed admires the raw political power of what he calls the "anti-patriarchy movement." Bannon, Green wrote, watched Dwayne "The Rock" Johnson as he was watching Oprah Winfrey on stage delivering a politically-charged speech. "He's ruined his career," Bannon said, according to Green. "If you rolled out a guillotine, they'd chop off every set of balls in the room." Green, who is also a CNN political analyst, writes that Bannon believed Oprah could threaten the Trump presidency if she were to become involved in the 2018 midterm elections. He argued, Green wrote, that her activism could assist the Democrats in taking back the House, allowing Democrats to impeach Trump. But Bannon went further than that, declaring, "The anti-patriarchy movement is going to undo ten thousand years of recorded history." "You watch. The time has come. Women are gonna take charge of society," Bannon said, according to Green. "And they couldn't juxtapose a better villain than Trump. He is the patriarch. This" -- the Golden Globe Awards -- "is a definitional moment in the culture. It'll never be the same going forward." The publication of the new edition of "Devil's Bargain" comes on the heels of the wild success of Michael Wolff's "Fire & Fury," which has sold north of a million copies. Wolff's book, which quoted Bannon making disparaging remarks about the president and his family, prompted Trump to publicly excoriate Bannon in a lengthy, blistering statement. Prior to "Fire & Fury," however, it was Green's bestseller that was said to have hindered the relationship between Bannon and Trump, with Trump resenting the amount of credit Bannon had received for Trump's 2016 election victory. Scott Moyers, publisher of the Penguin Press and Green's editor, told CNN in a statement that the company moved up the release of the paperback edition of "Devil's Bargain" from July. "Josh had important new access to Steve Bannon that contributed to a terrific new foreword to his bestseller DEVIL'S BARGAIN," Moyers said. "We decided it was too important to the national conversation to wait the normal span of time to publish the paperback." Representatives for Winfrey and Johnson did not respond to requests for comment. Bannon also did not respond to a request for comment. Correction: An earlier version of this article mischaracterized Bannon's statements about what he calls the "anti-patriarchy" movement as being "sharply critical." In fact, he was characterizing the movement as a powerful political force.